In the run-up to the Buma Music meets Tech Award at Noorderslag 2015, an update to our music discovery demonstrator Streamwatchr has gone live. An improved interface that is easier on your device’s battery life, some new functionality and a Twitter bot called @lyricswatchr are the most important ingredients of the update. A few weeks ago I visited a local high school as part of a series of efforts to get more high school kids to maintain an interest in computer science and possibly study the subject in university. I gave a sneak preview of a new version of a demo that we’ve been working on with Manos Tsagkias and Wouter Weerkamp, Streamwatchr. Streamwatchr offers a new way to discover and enjoy music through an innovative interface. 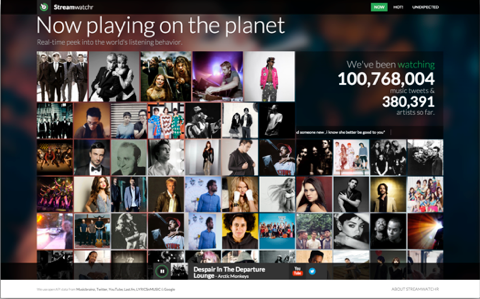 We show, in real-time, what music people around the world are listening to. Each time Streamwatchr identifies a tweet in which someone reports about the song that he or she is listening to, it shows a tile with a photo of the artist and a play button (on mouse over) that does, indeed, play the song (from Youtube). 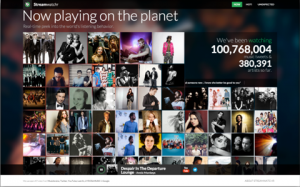 Streamwatchr collects about 500,000 music tweets per day, which is about 6 tweets per second. I visited a class of 12 and 13 year olds at a local high school here in Amsterdam. As my laptop and the beamer refused to talk to each other I walked around the class room with my laptop to demo Streamwatchr, with Streamwatchr running in full screen. While walking around I talked about some of the technology behind it (entity linking, data integration, open data, etc). Occasionally, I put the laptop down on a table so that the students could interact with Streamwatchr. I was amazed to see how addictive the interface was … a screen full of tiles, 6 of which flip and change at random every second, kept every kid glued to the laptop. Later (private) demos of Streamwatchr to friends and colleagues led to similar scenes. As I observed the high school kids interact with Streamwatchr, some interesting questions came up. What is the appeal of random changes to visual elements at a pace that seems to be slightly higher than one can actively track? Is it that there is always something on the screen that you have not seen yet? But that you think you don’t want to miss? At which speed should those random changes occur to be optimally captivating? Should the changes really be random or should they provide maximal coverage of the screen (in the obvious spatial sense) to be optimally captivating? There’s a great set of experiments to be run there — an unexpected side product of an outreach activity.